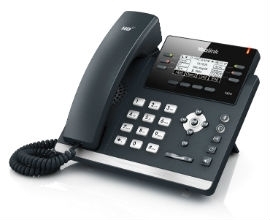 The stylish, feature-rich T42GN entry level business phone is ideal for busy professionals. The clear display and simple navigation enhances productivity. The dual-port Gigabit Ethernet telephone benefits from an intuitive interface, BLF’s, HD Voice, 3-way conferencing, handsfree speakerphone and supports corded or wireless headset and EHS. With simple, flexible and secure provisioning options, the T42GN is certified compatible with 3CX, Asterisk and BroadSoft BroadWorks, making it the ideal entry level IP phone for businesses.